A day at the beach is day of good old fashioned family fun for most people. Adults and children alike! Through small world play children get the opportunity to relive those moments and play out their own fantasy adventures. Small worlds can be quick and easy to set up. 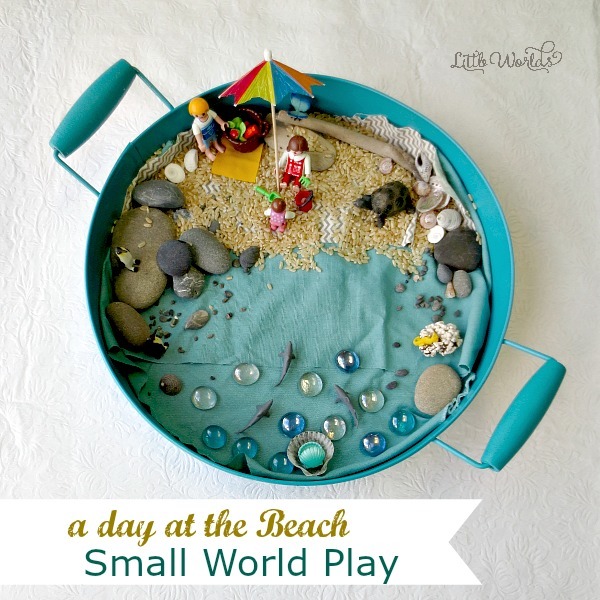 In this post I’ll show you how we set up a beach small world invitation to play in a simple tray with a handful of materials from around the house. To set up an invitation to play you don’t need much. 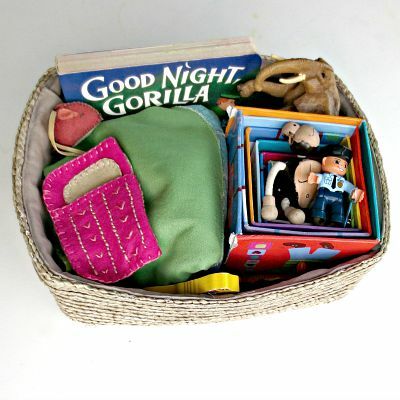 Use your imagination and everyday items from around your own home. Whether I’m setting up a small world by myself or my 4 year old daughter is, the process is usually the same. 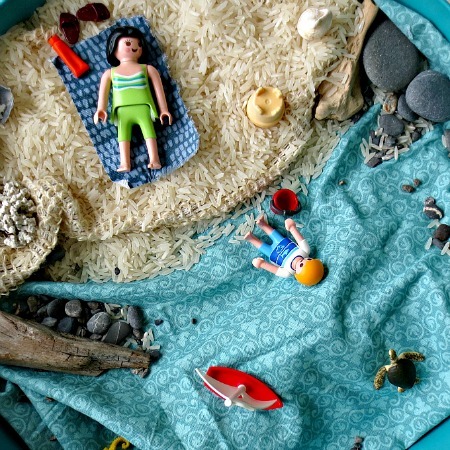 We start with our theme, which in this case is “a day at the beach”. Then we brainstorm about the things we think should be represented: there should be a beach, water, sand, people, rocks, shells, picnic and so on. I make a point of going with whatever my daughter suggests. If she thinks there should be a dragon at the beach that day, a dragon we shall find! Next we think about our materials. This is the fun bit and can easily be turned into a game by asking children to find something blue for example. 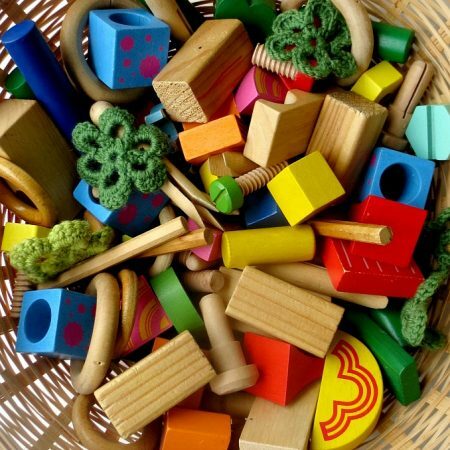 We usually end up with a huge collection of random items that we may or may not end up using. 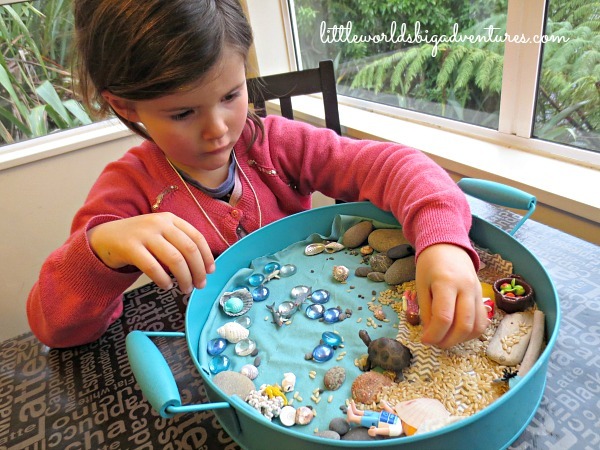 Then we put it all together.The water goes here, the rocks are there, this is where the treasure will be buried and that is where the crab’s house is. When my little girl is playing on her own, this is usually where I leave her to it. She’s four and will always ask me to help her “getting her place look pretty” but once we’ve got our materials and I’ve helped her think of things to use, she prefers to set it all up herself. It’s part of the play process and good for her to do her own thing. When it is just me setting up an invitation to play (as a surprise for when she wakes up maybe) I like going into detail. And I know that she likes discovering “little scenes within the scene”. With some small worlds I go all out and with others I just quickly use whatever I have got handy. If you’re using a common household tray like I did this day, there’s only so much space to work with. So keeping it simple is key. I covered the bottom of the tray with fabric scraps in a beige/brown chevron print and simple even blue colour. I poured some rice over the chevron to mimic sand. 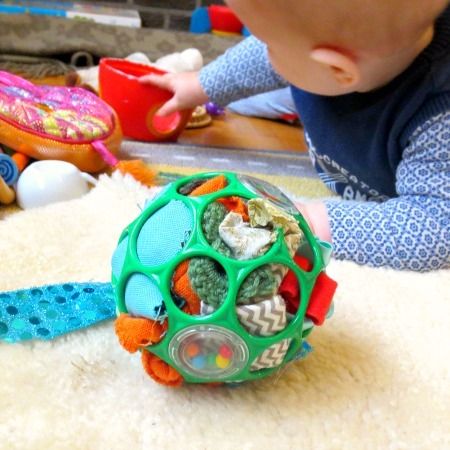 Adding any kind of sensory element to a small world is usually a big hit with children. In the sand I placed some rocks, seashells and driftwood. It created the perfect picnic spot and I found one of those paper umbrellas in my craft supplies which added some cuteness to the scene. 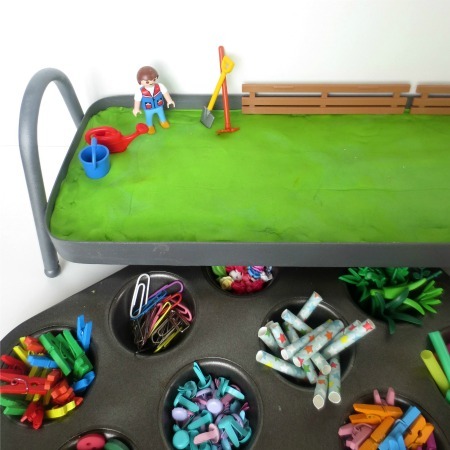 The little Playmobil people we have seemed perfect to play out the scene and I also used their food and tools. 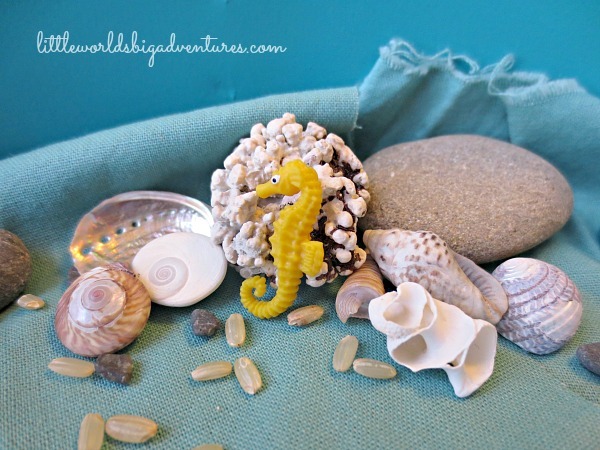 Closer to the beach I made a little reef scene with a real piece of coral, some seashells and a little seahorse. On holidays my husband and I I used to dive and snorkel often. We’ve told many stories of our underwater adventures. You’ll need a lot of imagination to get close to the real thing, but this little scene is a good first effort! As you can tell, many adventures happen very quickly and randomly in small worlds. People had to take naps, penguins had to hide and it was low tide all over the sea so the baby could crawl in to take the gem stone. All of a sudden there’s a giant turtle on the beach who wants to eat all the sharks. But that’s ok, because turtles are allowed to eat sharks, but only one or two or they will get a tummy ache. And it’s very hot. Mummy, did you bring any sun cream? One of my favourite things to do is to eavesdrop when children are playing out little scenes out loud. It is too darn cute and the stories they come up with are often worthy of their own illustrated children’s books. Even if it will only make sense to another four year old! 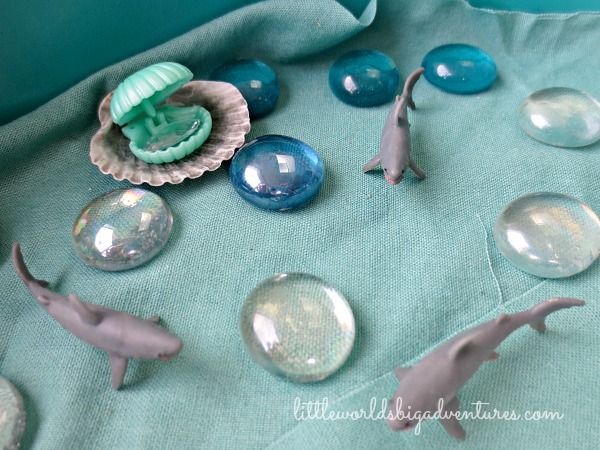 Setting up small worlds is so much fun packed in such a simple activity. 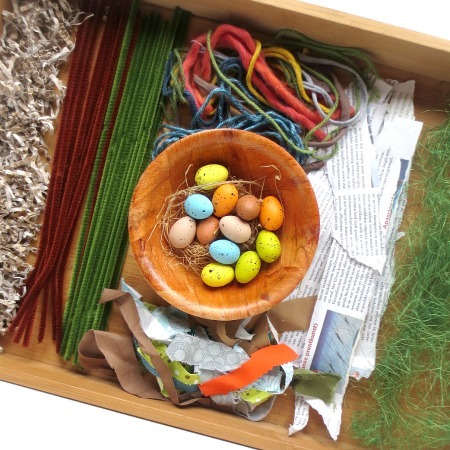 Each time you play it’s different and each child will engage with the materials presented in a different way. And that’s all ok. There is truly no right or wrong, there is only play. 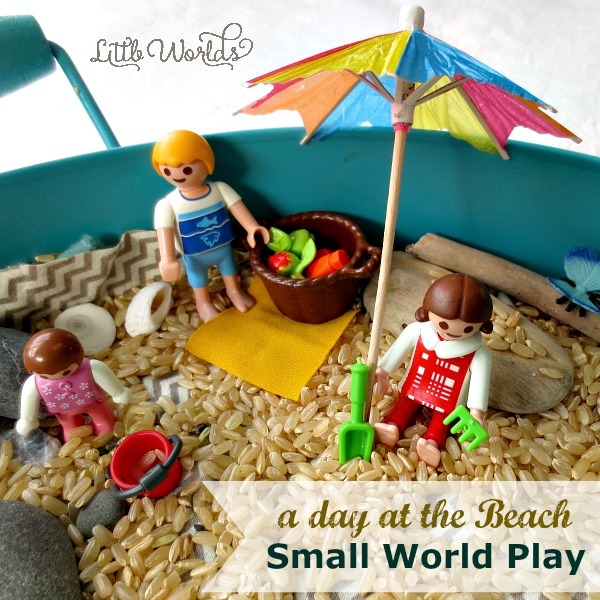 Would you like to read more about the benefits of small world play for your child’s development, you can do that here. 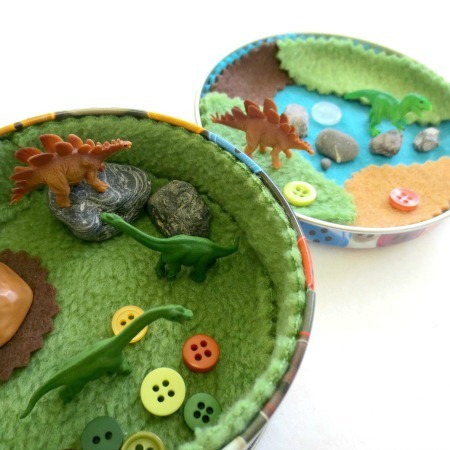 And if you’re looking for more small world play inspiration, have a look at all of our fabulous small worlds here, including the travel tins and story baskets. We love this! 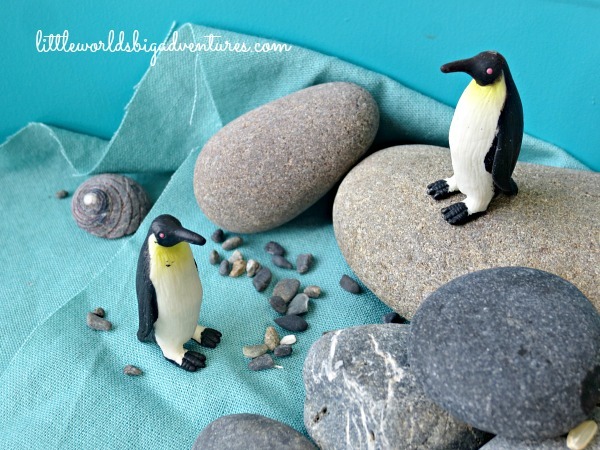 So much that we have featured it Peakle Pie as part of this week’s Frugal Family Linky! Thanks for sharing and hope to see you joining in again soon! 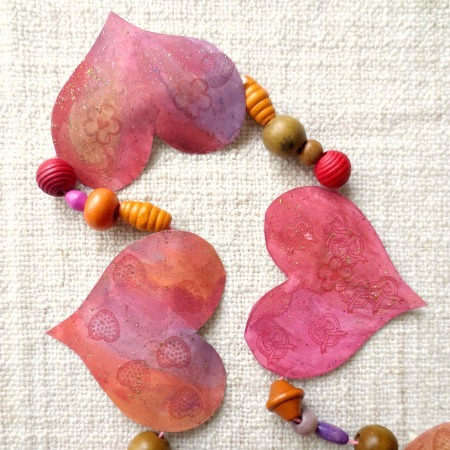 LOVE this idea – and all of your small worlds in fact. 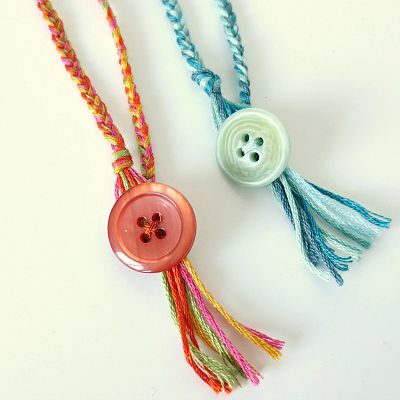 Have been admiring your site for a while and thought it was about time I commented! 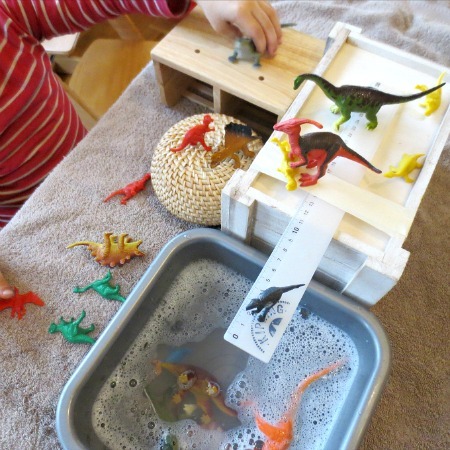 My little one is only just 2 and a half, so I’m looking forward to making small worlds like this with him, but I think we might start with something simpler. I’ve also just read your beginners tips and loved all the tips you have to offer for newbies. Thank you for your kind words! It’s so nice to hear that my little ideas can bring joy to other families. And btw, you’ve got a fabulous blog yourself!